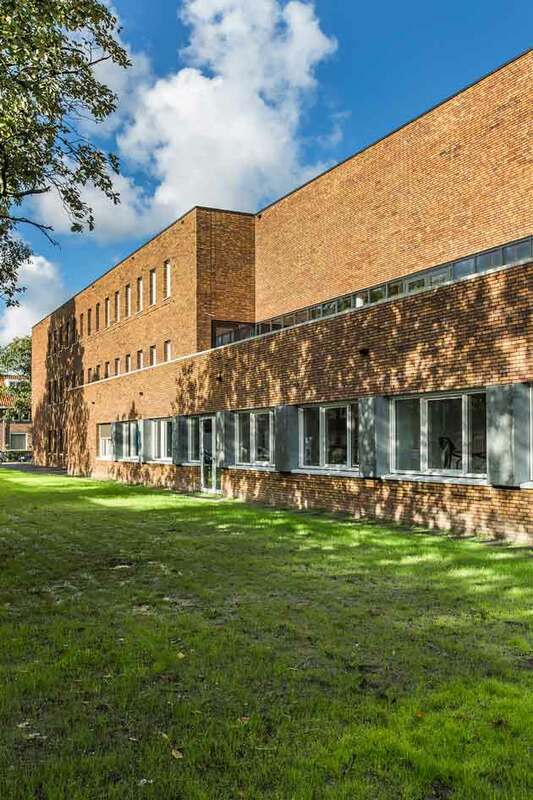 The school is situated in the Laakkwartier/Spoorwijk district, part of an urban plan designed by H.P. Berlage in 1908. It is part of an ensemble of school situated around a big open space mostly used as sport facility. In the Hague the same urban setting like this is used for schools en sport facilities. In this urban typology an open axis with two symmetrical schools on both sides is standard. To respect this typology the mass of the newly designed school responds to the mass of the monumental school, designed by J.M. Luthmann (1930). Like a twinschool, but then symmetrical. The building plot is long and narrow given the program of the school (including a gymnasium). In order to fulfill the needs of the school multiple use of the site was necessity. 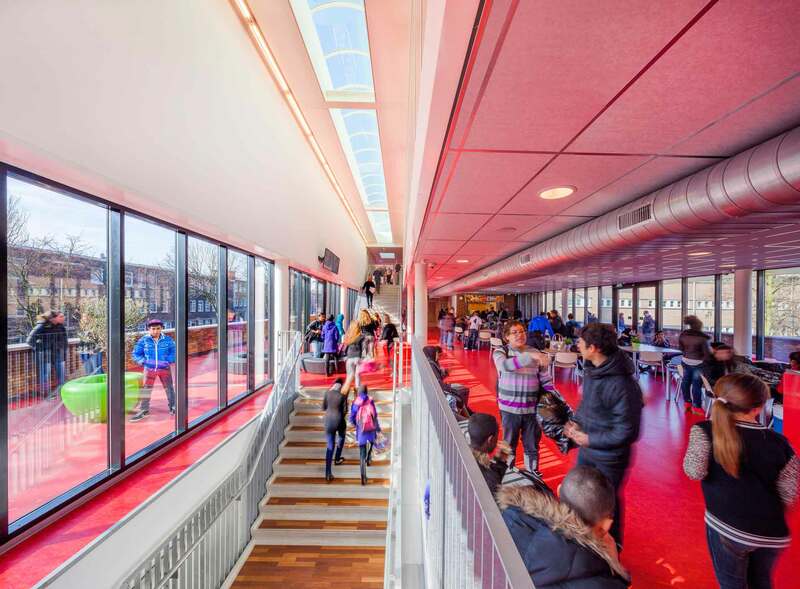 The schoolyard is lifted towards the first floor accesible through a big staircase. In this way a central meeting space is introduced together with the school’s aula. Inside an inline staircase is connecting all three levels of the school. A lot of transparancy inside was required to have a good overview for pupils and teachers en create an safe and open atmosphere. 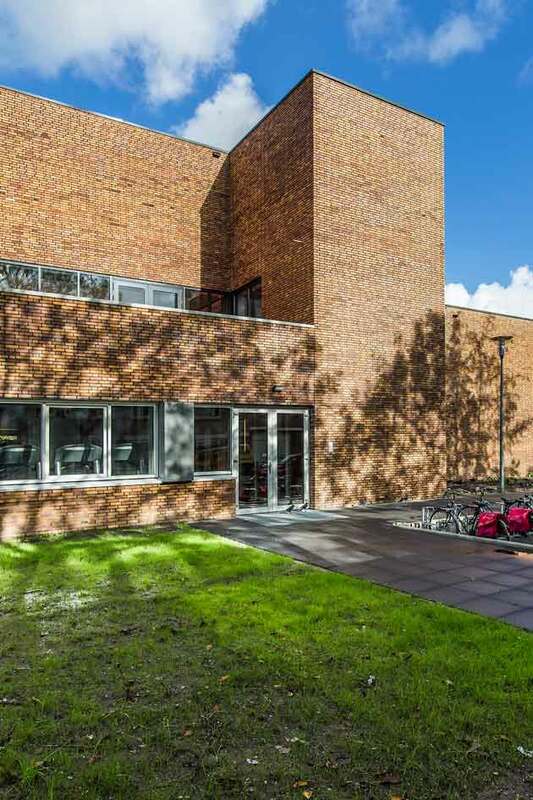 In contrast to the interior the facade of the school is mostly made out of brick. By using this material the building fits well into the existing surroundings. Because the opposing longitudinal walls are rather close to each other these walls are made load bearing. In this way all partitions inside are non-bearing which contributes to the buildings flexibility.